I was feeling pretty unhappy this summer (which was ages ago, I know...). One of the the things I find really difficult about that time of the year is that you're expected to be having fun, doing something, being outside, all the time. There's a lot of pressure to go to places. Basically, to me summer signifies a lot of "shoulds" and it's just super annoying, on top of the fact the hot and humid weather just drains my energy and makes me extremely uncomfortable. Autumn is my favourite season, but it's so short. The weather is cooling down now, so I'm able to carve out more of a routine that suits me and do activities that feel very "me". Now that I'm only working part-time, I've been able to make the most of the daylight hours so hopefully I won't slink into a horrible depression like I did last winter. When I realised I hadn't really gone anywhere in a while, I booked a short trip to Gdansk, Poland in August. It's a city I'd been interested in visiting for a while. A bit too far away from Berlin for a weekend, too close to take off a week, it had been hard to find a good moment to go, but I'd mainly been interested because Gdansk is multilayered in its history. It was a medieval Hanseatic port, it suffered a whole lot during WW2 (due to being considered part of Germany for a long time) and it was significant to the eventual fall of Communism in Europe (the shipyard workers' uprising in 1980, for example). 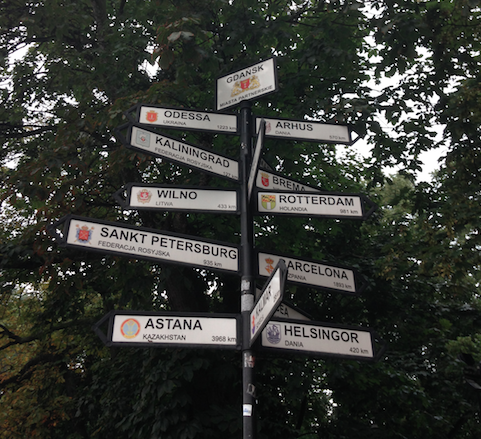 The Polski Bus journey took around 9 hours -- not ideal, but I couldn't afford the train or flight. We pulled up in Gdansk at 7am. I left my luggage at the hostel and wandered into the Old Town. My first port of call was Costa Coffee (you can take the girl out of Britain, etc. ), then I took a walk around the main square. The architecture was what you can expect from any medieval, central European city: ornate, earthy, colourful. I walked down to the Vistula River (which is called Wisła in Polish and Weichsel in German). I got told off for almost not getting off the bridge in time for it to lift up, letting three ships pass through. I'd been planning to explore Gdansk by foot -- navigating transport in a new city where you don't speak the language is anxiety-racking -- but it turned out the place I'd wanted to go for lunch was in a totally different suburb, one that needed to be reached by train. I was already getting hungry and there was no way I was going to walk for two hours. I had brought some snack bars with me from Berlin to keep me going, so before I explored the transport options, I wandered to a residential area, lay down on the grass and dozed for a little while (cautiously making sure I didn't actually fall asleep; even though it seemed pretty safe there, I did have all my valuables on me). I made my way to the main station to buy a ticket to Wrzeszcz (roughly "vzheshch"). The station was not laid out very clearly, so I practised pronunciation by muttering it under my breath a few times before approaching various locals to ask if this was the right platform. 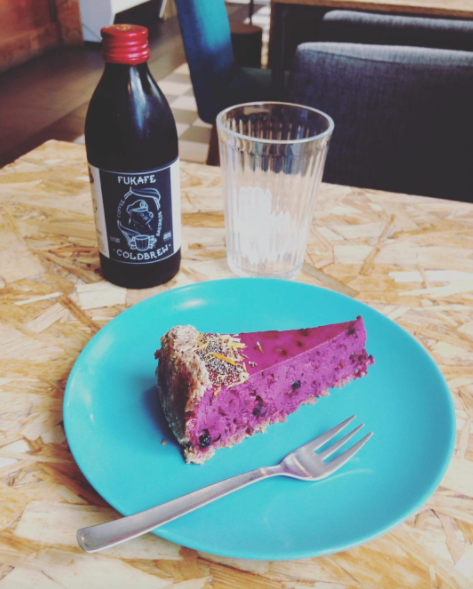 I went to a vegan café called fukafe and they didn't have food-food, as I'd thought, but they did have a lot of raw cheesecakes and other goodies. But that was fine, because there was a vegan pizza place about 15 minutes' walk away, luckily also located in Wrzeszcz! It was called Vege Pizza Port, had a queer and DIY vibe, and they also offered other vegan junk food like döner. The next day, I was determined to get to Westerplatte, the site of the first battle of World War II (between German and Polish forces). I had to walk a really long way to get to the right bus stop, but it was quite good to see the outskirts of Gdansk proper while hoping those grey clouds weren't harbingers of rain. I successfully caught the right bus and bought the right ticket using very rudimentary Polish, and then off to Westerplatte it was! It's a peninsula jutting out into the Baltic, so there were some good views out to sea. Once I'd entered the actual site, the first thing that struck me was this enormous concrete structure -- barracks destroyed during the war. It was quite impressive, especially inside. It was well-preserved, with metal rods holding debris up to make it safe to enter. I would have stayed at Westerplatte longer but I was tired, cold, the end of the day was looming, and buses were very infrequent. There were also a lot of school groups and a lot of visitors in general, plus the bus journey back was packed and on a really bumpy road. I had kind of got to the part of the trip where I was glad to be heading home the next day. I don't even remember what I had for dinner that night (which is saying something, as vegan-friendly eating opportunities were few and far between). An important discovery I did make was my new favourite treats. They are called Super Krówki, traditional Polish sweets that are now available in chocolate and toffee vegan flavours. So good, so of course I finished them off quickly (I didn't even get a chance to take my own photo). I have not figured out a way to get them delivered to Germany, so if anyone is going to Poland soon, please keep an eye out! I sort of regret that I didn't see more stuff in Gdansk that I'd written myself in an SEO article for a client a few years ago! But I felt really beaten down by the heat and the non-ideal hostel conditions. It would be nice to visit again when I'm not so rushed; perhaps I'll stay in Wrzeszcz and have more of a chilled city break.